“On my first mental health placement, a tragic incident resulted in the death of a service user. With almost 5 years experience as a support worker, this was something I hadn’t faced before. My training up until this point had equipped me with the skills and knowledge of what to do in such situations, and as a nursing student I know we did everything we possibly could to save the patient’s life. "Nothing can prepare you for this. There is so much emotion and stress, and the ‘what ifs?’ raced around my head for weeks afterwards. "Although I will be a mental health nurse when I qualify, I realise you cannot view mental health as its own entity. In this case, the service user had a physical health condition that affected her mental health. Physical health can be overlooked in mental health se­ttings, but it shouldn’t be. "People who use our services should be cared for holistically, with treatment addressing their physical and mental health needs. I will always aim to implement this in my practice. "This experience showed me how much nursing is a learning process. As nurses, we may come across conditions that we need to know about, however rare they may be. It is our responsibility to continue our professional development and understand our service users be­tter. This way, we can provide care that addresses all of their needs, including those that may not be what they initially accessed a service for. This is the care all our service users deserve and something I strive to achieve. "I want to become a nurse because I have the passion and drive to improve the situation of every person who comes in contact with health services. I can play a part in a life-changing outcome, or just be the person a service user can talk to. "Although our attempts to save this patient were unsuccessful, I helped in every way I could to save her life. This gave me the confidence to be an active team member, enabling me to provide the best possible care I can. I am now in my third year of training and this service user is always in my thoughts. I still experience a range of emotions when caring for service users, including sometimes the ‘what ifs’, but I feel privileged to have been involved in that person’s care. 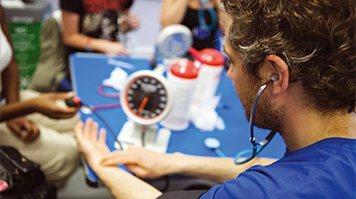 LSBU is proud to be one of the top universities in London for mental health nursing and is committed to delivering the highest standard of training to students, giving them the best start for a bright future career in nursing. Find out more about our courses in Mental Health Nursing. LSBU is supporting the theme of this year’s World Mental Health Day, with the overall objective of raising awareness of mental health issues around the world. This year’s theme has been set by the World Health Organization as psychological first aid and the support people can provide to those in distress.